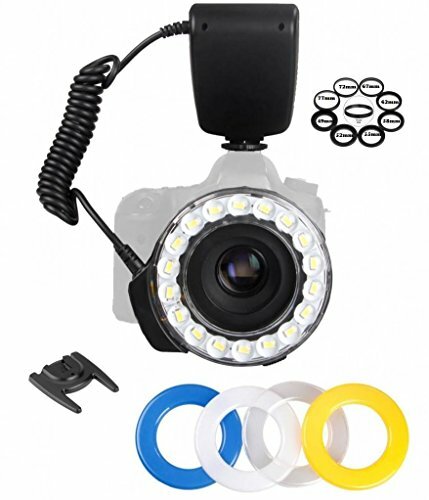 LED ring light is universal in design and independent of any specific TTL system. It is compatible with most DSLR lenses and ideal for macro and close-up shooting applications. 18 high-output LED array provides a guide number of 69' / 21 m at ISO 100. Light Mode will keep the light on continuously. Flash Mode will activate the light for approximately one half second at a time when the shutter is depressed; this will help conserve battery power. Left and Right Flash Modes will set only the left or right half of the light to turn on in order to give more dimensionality to your subject matter. An automatic power-saving function will turn off the ring light after 30 minutes of inactivity to conserve battery power. 1.6" backlit LCD provides visual display of battery life and light settings. Four clip-on diffusers are included: clear, frosted, amber, and blue. 49, 52, 55, 58, 62, 67, 72, and 77mm adapter rings are included. Stand/tripod mount features a 1/4"-20 thread on base.